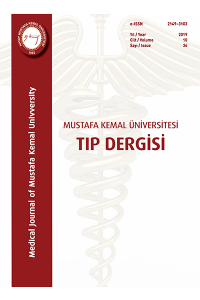 Medical Journal of Mustafa Kemal University is an open access scientific journal, which publishes original contributions in all scientific disciplines pertaining to human medicine. In this context, the Journal publishes original researches, case reports, reviews and letters to the editor based on clinical or experimental studies on all areas of medicine. By retaining copyright on the authors and permitting authors to enter into separate, additional contractual arrangements for the non-exclusive distribution of the journal's published version of the work (e.g., post it to an institutional repository or publish it in a book), to lead productive exchanges, as well as earlier and greater citation of published work. The journal covers all relevant branches in basic sciences besides the surgical and non-surgical specialties of the topics mentioned above.